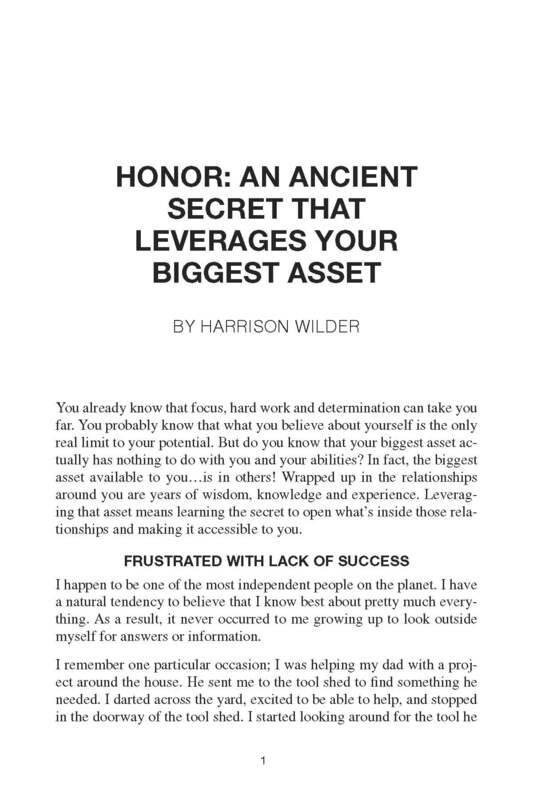 In HONOR: An Ancient Secret that Leverages Your Biggest Asset, Harrison Wilder shows you how to pull the hidden treasures out of relationships around you. This free mini-eBook will open your eyes to the incredible value of those around you and give you five ways to practice honor and access all of that hidden potential. These 7 easy-to-read pages introduce you to the concept of Honor and will inspire you to explore more into this ancient practice. 1.) Follow my blog. Enter your email address and click the “follow” button on the right side of this page to receive new posts in your inbox. 2.) Share this page with your friends. Use the sharing buttons below or CLICK TO TWEET. 3.) Download the mini-eBook (pdf) by clicking here.